The Grizzly Chick is made entirely from a small soft chicken feather called Chickabou. The feather is often used for tails on damsel flies and small woolly buggers and in some leach patterns. The Grizzly Chick is composed entirely of Whiting Farms Grizzly Chickabou feathers. One for the tail and five or six for the wing. Chickabou is Whiting's trade name for grizzly marabou feathers found on the the breast and between the thighs of hen chickens. They are smaller, finer, and more delicate than turkey marabou. Most feather merchants offer them with names like Mini Marabou and Grizzly Marabou. Don't settle for less. Buy Whiting Chickabou. Check the Whiting Farms web site for a dealer near you. Chickabou feathers are ideal for the Grizzly Chick which is slightly more than one-inch long from the top of its head to tip of its tail. Every bit of the fly pulsates and undulates in the water. Once its tied, stick a bodkin through the eye, move it around in a glass of water, and you'll see why this little guy takes fish. 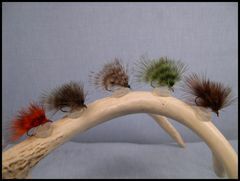 I tie the Grizzly Chick in five colors - Natural Grizzly, Orange Grizzly, Brown Grizzly, Olive Grizzly, and Chartreuse Grizzly because there seems to be times when color makes a difference. 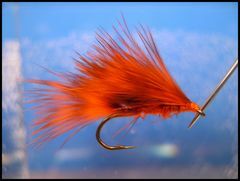 The best hook for the Grizzly Chick is a Nymph/Wet Fly hook, the Mustad 9671. If you're not into Mustad hooks the Tiemco 5262 is the Mustad 9671 equlivent. When you are tying in the Chickabou feather tips for the wing make sure that each successive tip is a little longer than the previous one. Finally, be sure to tie up different colored Grizzly Chicks. I have seen days when bluegills wouldn't touch a brown or olive pattern but they were crazy for the orange pattern. Go figure! 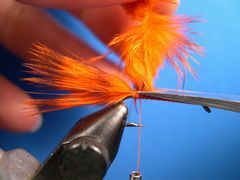 Be sure to attach the Grizzly Chick to the tippet with an open loop knot to give the fly maximum animation in the water. Check "On The Water" for fly fishing knot illustrations. 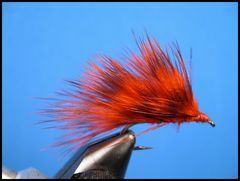 I purposely don't incorporate weight into this fly because I fish it mostly in still water and I want it to be as boyant as possible so that it appears as natural as possible. 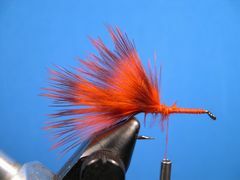 If you want to add weight simply clamp on a very small split shot ahead of the fly. 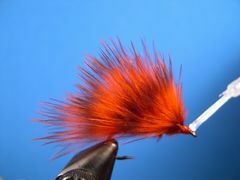 If you are going to use the fly mostly in moving water I would suggest that you tie up a bunch with a small bead for the head. I like to cast the fly toward shore and let it sink. This takes a few moments but often you will get a strike on the fall. If you don't, strip the fly back slowly with a line hand retrieve. 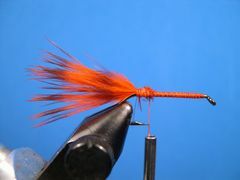 Clamp the hook in the vice, crimp the barb, and attach the tying thread at the hook's eye. 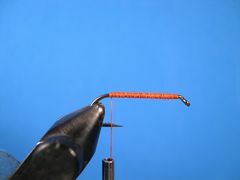 Lay down two or three layers of thread from the front to the rear of the hook's shank. 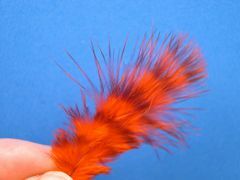 Select a well shaped and well marked Chickabou feather for the tail. Stroke back the fronds of the Chickabou feather to expose the tip and remove it by pinching it with your fingernails or clipping it with your scissors. This is the way the Chickabou feather looks with the tip and stem removed. 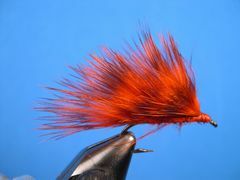 I generally do this to all marabou - turkey or chicken - before I incorporate it into a fly pattern. 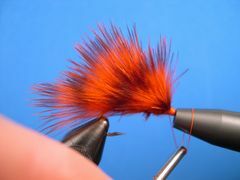 This little step makes the marabou so much more lively in the water. And, that's a good thing! 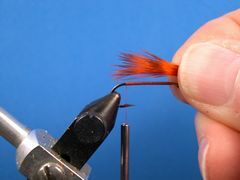 Measure the feather for the tail against the hook. The tail should be at least as long as the hook. 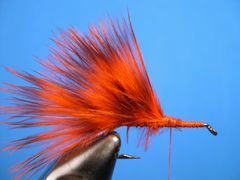 Tie in the feather for the tail as shown in the photo. Then clip the excess with your scissor tip. 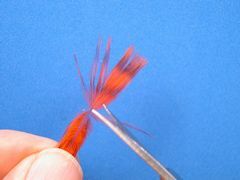 Each successive feather should be tied in and the excess removed in the same way. Notice where the thread is hanging in preparation for tying in the first feather for the wing. 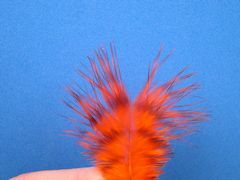 Measure the first wing feather as shown in the photo. 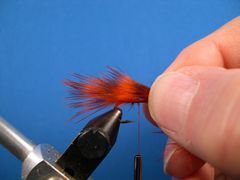 The tips of the feather should extend to about the center of the tail. Tie in a second feather for the wing and remove the excess material. Note where the thread is hanging for the next wing addition. This should be the procedure until you finish building the wing. Continue adding Chickabou feathers making sure that each successive tip is slightly longer than the previous. Continue this process until you have only enough room for a small thread head. Add head cement. I like to paint my thread heads with Hard-As-Nails nail polish. The best head cement around. Your Orange Grizzly Chick is finished. Don't hesitate to tie up the other colors. They all are great panfish producers.